Here’s the first celebrity in the 3-part “Martin” series: Maxim Martin. I’ll keep this one short since I’m doing the Montréal-Toronto trip today on the highway (I’m actually quickly writing this post from an OnRoute roadstop on the 401). Originally Franco-Manitobain from Manitoba, Maxim Martin made his entry into Québec’s pop-culture with a big leap from doing comedy gigs in Winnipeg to doing comedy at the Juste pour Rire festival in the 1990s. Québec has since been his home. Considering how well known Maxim Martin is, he’s not controversial or extreme in any sense. But there are some notable things about him. His love-life has occasionally been the subject of tabloids and talk shows, and he doesn’t shy away from it in his own media appearances or comedy acts. For many years, he has been a single father. He regularly talks about his adolescent daughter, Livia, in his comedy acts and on other media platforms – and he she has appeared in television herself. Apparently she has a twitter feed which has garnered a lot of attention. Although he’s a comedian at heart, Martin has been a radio host on one of Montréal’s most popular radio stations, he has been the co-host of a morning television bric-a-brac show, he has hosted regular sports slots on TVA Sports (he’s a big sports fan, and he has reported quite a bit on junior hockey leagues), and he’s also an actor. 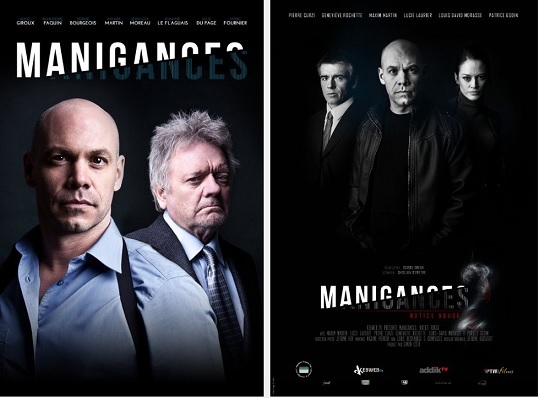 Two recent films in which Martin has starred are the thriller films Manigances (2012 & 2013). One thing worth mentioning is that he is one of the “greener” pop-culture stars on environmental issues. His website even features elements on his thoughts on the idea, and the David Suzuki Foundation once did an online feature of Martin. Maxim Martin at one point hosted an environmental program on the Canal Vox television station. After a 2-year stage comedy absence, he came roaring back this week with sold-out shows at Théatre St-Denis in Montréal. Just to give you an idea how popular he is, I tried for two days to get tickets in Montréal, without success, owing to how much demande there was for tickets (I guess it really was the show to see!). Oh well… next trip. Back to Toronto now. By Quebec Culture Blog 101 in Comedians, Movie Actors, Television Personalities on February 26, 2015 .